We're not sure if they wanted to spell Superman, Sulfurman or if they truly did mean to spell Sulperman. This is what we refer to as Konglish (Korean English) and it can be quit funny sometimes. Here's a few more funny, interesting and/or out of the ordinary things that we have seen so far in Korea. you should know that this list is merely a glimpse and not a complete list of oddities we have come across in this strange land we call home right now. This is a restaurant in the new downtown area of Andong. This part of town is called Oakdong. It is where all the young professionals hang out at night. There is also a place in this area called "Indies." It's a Korean version of a western style bar, complete with a larger than life American Indian statue in front, palm trees and pirates. I don't know how else to describe the place. You'll just have to come and see it...Seriously!!! Ok, I don't know why this sign made me laugh so hard. Maybe it speaks for itself. I think it is a restaurant advertisement, but there are no words on it and there is no restaurant below the sign. I think it may just be someone's grandmother. This depiction of the South Korean military isn't what I would call intimidating. I don't think we need to say much about this one either, besides WOW!...WOW! In Andong there are a few U.S. based restaurants, like Pizza Hut, Dominos, Baskin Robins and Dunkin' Donuts, but there are some different types of cuisine at these comfort food establishments. This is an example of one of those differences. We went into Dunkin' Donuts one day a few weeks ago and amongst the chocolate covered and sprinkle donuts were donuts like this garlic glazed. I'm not sure how that would go with coffee and I don't think I want to. The "jelly filled" donuts are the ones you have to look out for though because you never know when you bite into one if you'll be getting strawberry or some sort of strange meat medley. I kind of like the surprise from time to time though...It keeps you on your toes. This week, Danny and I had to say goodbye to another beloved Korean family member: Chubs. Chubs was a wonderful fish full of life and food, but sadly he passed away earlier this week. Unfortunately we don't know the cause of his death, again, but we are going to try to deal with our stages of greif apropriately before we go pointing fingers. We feel that we really didn't get to experience as much as we wanted to with Chubs, and now that he is no longer with us there is only one thing to do...wallow. Danny is taking the loss of two fish in one month pretty hard, so sympathy cards and flowers are appropriate. I only hope that he can look back on his time with our two Korean friends with joy and fond memories. We are thinking about getting another pet to help us move on with the life we still have to live, but for right now the wound is still too fresh. I know I will always remember how Chubs loved to eat and therefore he had sort of a waddle to his swim (if fish could waddle). Chubs was so heart warming and even in the breif time I knew him, he made a difference in my life. Your memory lives on. Rest in Peace Chubs. Danny's Birthday: the big two seven! Apparently our church enjoys parading around town on Easter. The entire church followed a group of Korean drummers through the streets of Andong, and needless to say we didn't make many friends with the people trying to drive their cars that day. We walked with the parade to the center of downtown and were handed lots of eggs along the way. There are no Easter egg hunts here in Korea, people just hand out tons of hard boiled eggs and eat them in the streets so there are egg shells all over the ground. Danny's birthday definitely started with yet another funny Korean cultural experience and so after we left the parade we went to continue the birthday festivities. We went to a movie, ate some delicious homemade fish tacos, and kept things pretty chill. The next day we went out to sushi with the people from our Bible study and ate fish head, jellyfish tentacles, and a few other slimy things that we still can't identify. Still, the most exciting part of his birthday came on Wednesday thanks again to our amazingly generous Bible study. As our friends came over to discuss the book "Crazy Love", Danny answered the door and was surprised by a brand new bike! We had been looking for some cruiser bikes to ride around town and our friends Paul and Andrew found this awesome black cruiser for Danny... seriously, these are awesome people and we absolutely are so excited to have a new way to travel in style! As many of you know, cruiser bikes are the "cool" way to ride around town in the States, but when Danny brought his bike to school the first day, his students proceeded to tell him he has an "old man" bike. Obviously, we both disagree with the Korean teenagers, but the most halarious thing that could have happened the first day we take our first big bike ride was this: as Danny walks out of our apartment building, a cute Korean old man rides by on the EXACT SAME BIKE! AMAZING!! I had to take a picture, but that old man was fast so I only got one of Danny riding behind him. Ha ha. Just an interesting birthday fact about Korea: Korean age is different than "western" age. When a Korean is born, they are already considered one, then when a new year comes, they are immediately considered two years old. So if you were born on December 31st, you are one the day you are born, and then the next day, New Years Day, you are already 2! Kinda strange, because Danny and I have a different Korean age then an American age. Well anyways, we are so grateful to be surrounded by such great people. It definitely makes spending holidays and birthdays away from home easier and we are excited to see what the next holiday we experience in Korea brings. Happy Birthday Danny, I love ya buddy! Sorry, just a quick post today. I decided that today I would ask for your help: I have been sick for a while (last week I lost my voice for 4 days) and now Danny is sick as well. It is discouraging that this cold won't go away, and it's even harder to teach and try to be energetic so I wanted to ask for you all to send up some prayers that we would get better soon. I thought I would attach this picture with my request because not only am I sad that we are both sick, but I am sad because there is a restaurant called "Mexicana" in Andong that has absolutely nothing to do with Mexican food. It is a fried chicken place and a beacon of lies because it reminds me that I probably won't have chili rellenos for over a year. Mexicana...why do you torment me so? 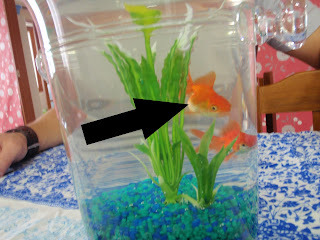 This brief post is in memory of our beloved pet gold fish: Kitty. He was a good fish. He swam like no other and the joy he brought us was unsurpassed. ...BUT, when I got home from school on Thursday and went to feed our little orange friends I was sad to find that Kitty had in fact bit the dust. I regret to inform you that Kitty-Kat The Fish joined His fellow comrades in that big toilet bowl in the sky. We are still not sure of the cause, but I do have some theories. 2 to be exact. 2. Kitty passed away due to starvation. Now, I'm not one to point fingers and so I won't name any names, but another, possibly "chubby" gold fish may have been the cause of Kitty's demise. Kitty just never seemed to be able to reach the top of the bowl in time to have His pick of the daily cuisine. Other larger more "bullyish" fish would constantly beat him to the top and gorge Himself...I mean itself on more than It needed. The investigation into this heinous event is ongoing and i promise to not stop until I get to the bottom of the mystery.